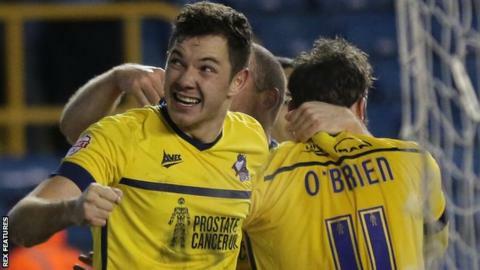 Gary McSheffrey and substitute Jim O'Brien scored in each half to earn Scunthorpe their fourth successive win and dent Millwall's play-off bid. McSheffrey capitalised on a mistake by Sid Nelson to score his fifth goal of the season in the 17th minute. His late replacement O'Brien, on his Iron debut, confirmed the win in second half injury-time with a low shot. It was a seventh home league defeat of the season for the Lions, who remain in sixth place in League One. "It's a massive win coming off three good victories. Our lads were coming here full of confidence but we know this is a very tough place to come and a team which are flying high in the division. "We prepared right and we knew what they were all about and we did what we try to do day in and day out. "It's pleasing for us that the lads are working so hard as a group, not as an eleven, not as a squad as a full group of twenty-five players. "It's great to see them getting the rewards when we come to places like this." Match ends, Millwall 0, Scunthorpe United 2. Second Half ends, Millwall 0, Scunthorpe United 2. Goal! Millwall 0, Scunthorpe United 2. Jim O'Brien (Scunthorpe United) right footed shot from outside the box to the bottom left corner. Assisted by Neal Bishop. Attempt saved. Byron Webster (Millwall) right footed shot from the centre of the box is saved in the bottom right corner. Attempt saved. Stephen Dawson (Scunthorpe United) right footed shot from the left side of the box is saved in the bottom right corner. Corner, Scunthorpe United. Conceded by Ben Thompson. Substitution, Millwall. John Marquis replaces Nadjim Abdou. Neal Bishop (Scunthorpe United) wins a free kick on the left wing. Substitution, Scunthorpe United. Greg Luer replaces Paddy Madden. Corner, Millwall. Conceded by Murray Wallace. Corner, Millwall. Conceded by Jordan Clarke. Attempt missed. Jim O'Brien (Scunthorpe United) left footed shot from outside the box misses to the right. Attempt missed. Paddy Madden (Scunthorpe United) right footed shot from the centre of the box misses to the left. Substitution, Scunthorpe United. Jim O'Brien replaces Gary McSheffrey. Jordan Clarke (Scunthorpe United) wins a free kick on the left wing. Attempt missed. Lee Gregory (Millwall) right footed shot from the centre of the box is close, but misses to the left.